Pilsen, on Chicago’s west side, is full of art. The neighborhood is known for its creative murals and unique, contemporary pieces displayed in public. A rich mix of cultures has thrived over the years in Pilsen so you’ll never be at a loss for local shops, restaurants, or interesting neighbors–and you’ll always discover a cool new sight on your way. As your Pilsen movers, we’ll help you add your own distinctive space to this colorful neighborhood. Pilsen is already home to about 70,000 people, split evenly between woman and men, with an average age of 30. Here, people tend to live together: the average household includes about three people. Of 25,000 total homes, almost a third have children. The average yearly income is $49k, and education levels run across the board. Originally settled by German and Irish immigrants in the 1840s, Pilsen was named decades later by a group from Bohemia (today the Czech Republic), who adopted the name from a major city in their home country. During World War I, more immigrant groups moved in to support labor needs, including the Mexicans who defined the neighborhood in the mid-20th century. 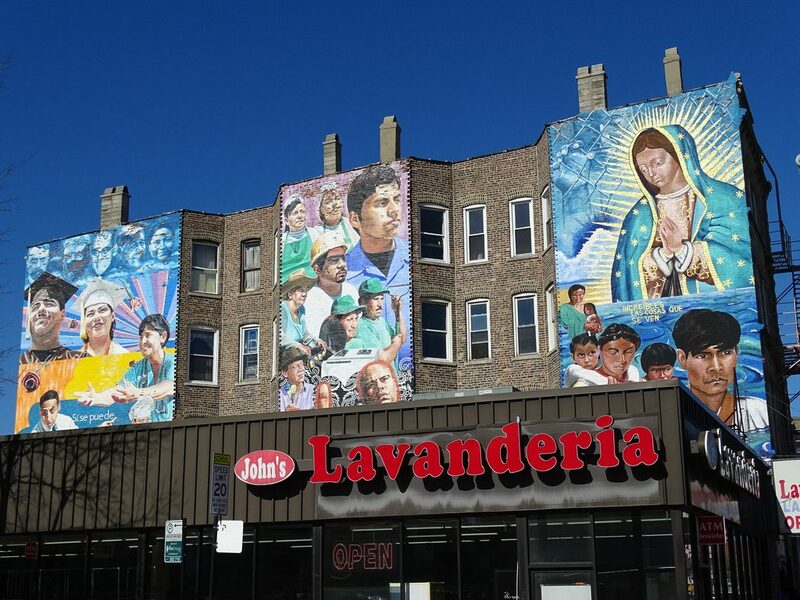 Mexican residents in the 1950s and 60s began creating Pilsen’s distinctive murals to commemorate their history and culture. Today, Pilsen is recognized for its community focus and creative spirit. Now you’ve got the gist, here are some highlights—and basics—we found to help you start your best Pilsen life. Harrison Park: Outdoor sports facilities, indoor pool and community center. Dvorak Park: Outdoor pool and park, sports leagues for kids and classes for all. Chicago Urban Arts Society: Non-profit exhibition and community space. National Museum of Mexican Art: Free admission. Thalia Hall: Diverse live shows and public events. Knee Deep Vintage: One of a few vintage clothing stores in Pilsen. Modern Cooperative: Handmade, restored, and vintage furniture and jewelry. Open Books: Used books raise funds for literacy programs. Thai: Bodhi Thai Bistro. Delivers. Mexican: Canton Regio. Big portions, family style, BYOB. Tamales: Dia de los Tamales. Farm-to-table focus, Day of the Dead decor. Basics: Pollo Express. Chicken, rice and beans. Southern USA: Honky Tonk BBQ. Live music. Global: Pl-zen Gastrocantina. US comfort food with international flair. Brunch: Azul 18. Closes 3pm, BYOB. After the Show: Dusek’s Board and Beer. Classy menu served late. Next to Thalia. Late Night: Coyotes Restaurant. Open 24/7. Dessert: La Michoacana. Ice cream, homemade popsicles, and snacks. Cocktails: Punch House. In Thalia basement. Food served late. Food: Del Toro. Authentic menu and unique drink options. Quirky: Simone’s Bar. Decor like none other. Dive: Skylark. Cash only, serves food. Outdoor: La Vaca Margarita Bar. Pitchers and a patio. Intimate: Tack Room. Cocktails and wine with food pairings. Dancing: Harbee’s Liquor and Tavern. Huge beer menu. Aldi: All grocery options, discounted. Pete’s Fresh Market #06: Local chain, hot food bar. Cermak Fresh Market: Local chain, multicultural focus. Carniceria La Providencia: Groceries, homemade food. Cafe Jumping Bean: Sandwiches in colorful surroundings. La Catrina Cafe: Local artwork. Kristoffer’s Cafe & Bakery: Famous for tres leches cakes. La Parada en Pilsen: Breakfast, lunch, milkshakes. University Village Dog Park: Provides drinking water. Pilsen’s Fitness Center: Equipment, classes, personal training. Energym Gym & Nutrition Bar: Equipment and cafe. This has been a tiny sampling of the great things you’ll experience at your new Pilsen home. As a seasoned Pilsen moving company, we’ve learned all about the staples and cool places in the area. We’re happy to share more! As you’re planning your big move, cross one major thing off your to-do list, and book Pilsen movers who’ll a take load of stress off your mind. Call us at New City Moving, and we’ll help you move safely, smoothly, and on-schedule, so you can settle right in and start living your greatest Pilsen life.